Most of us have been there, sitting in a park or on our porch, enjoying the beautiful summer day and a refreshing cold drink, when suddenly an unidentified flying bugger approaches. Is it a bee? Is it a wasp? We’re just not sure! Probably confused by the same notion, one internet user put together an “infographic” to help everyone out. “A Comprehensive Guide to Yellow Stripey Things” identifies 8 different kinds of flying insects and describes them in the best way. Scroll down below to see the guide yourself and tell us what you think! These guys are big fans of wood, especially unfinished or weathered wood like fences, porches, etc. where they dig tunnels to make nests, thus their name. Rarely living in social nests, these bees are solitary creatures. 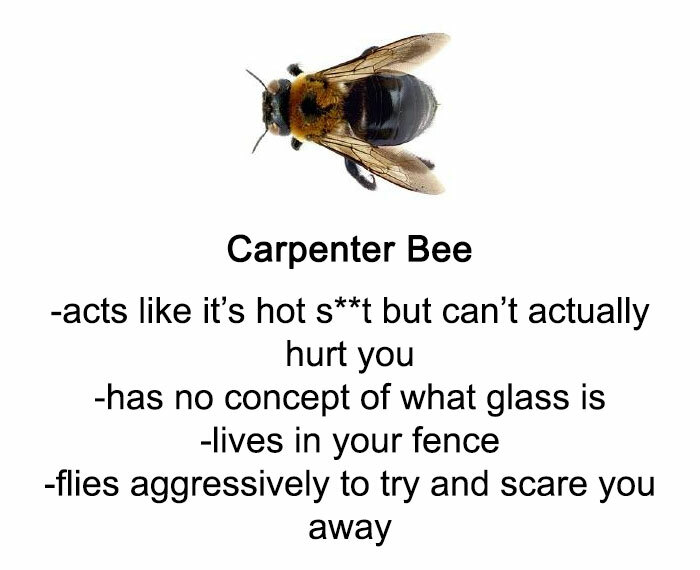 Carpenter bees are not aggressive or dangerous, especially male bees, as they don’t have a stinger. Having short mouthparts, these bees are especially important in pollinating shallow flowers which are rarely pollinated by other insects. The domestic honeybee is the textbook bee that (hopefully) every person could identify. 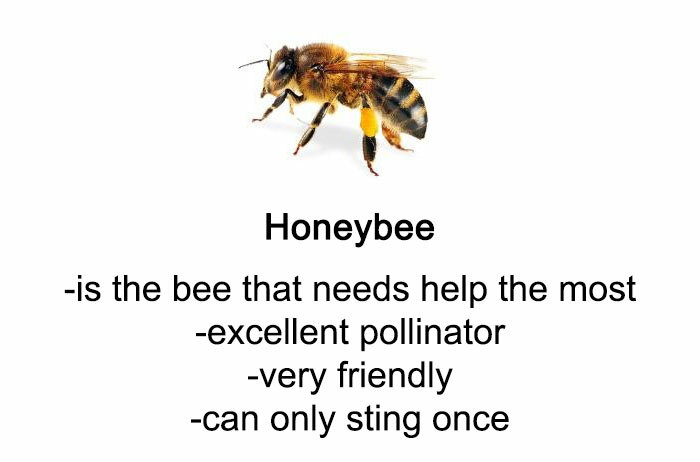 Distinguished by production and storage of honey, this bee has been domesticated and used for the production of honey and pollination of crops for centuries. As they’re excellent pollinators they frequent fields and wouldn’t shy away from a flower on top of your windowsil. However, while one or two visiting bees might not seem like a problem, finding a hive on your property can be quite a scare. This might prompt a person to call the pest control, but it’s EXTREMELY important to keep the hive alive, as they’re a vital part to the ecosystem, so it’s best to ring up a beekeeper for assitance. 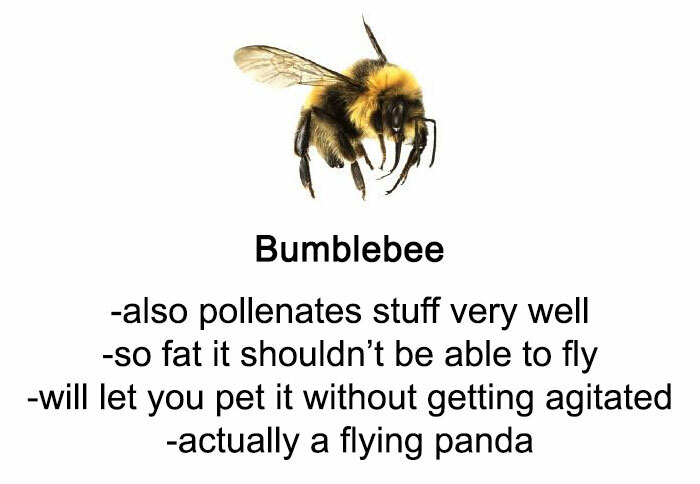 The fat fluffy friends of the bee world, bumblebees are here to pollinate your crops and flowers. Social creatures who build nests and form colonies with a single queen. These soft ‘flying pandas’ are non-aggressive and won’t sting unless protecting their hive, in which case you better run fast as their stings have no barbs, like honeybees’, which means they can sting repeatedly! As the number of bumblebees has dropped drastically in North America, Europe and Asia, there have been many projects started as conservation effort. Hoverflies may look like bees and wasps, but it’s only a guise as they don’t possess a stinger to cause any harm. They use the disguise to try trick predators into thinking that they can fight back, just like bees and wasps could. 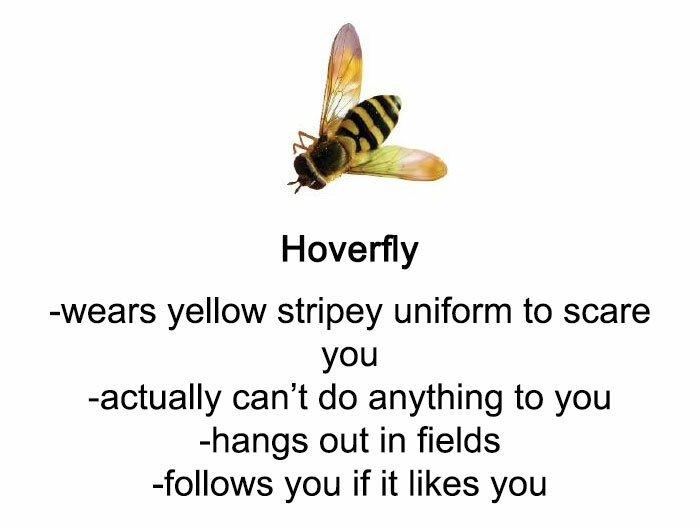 Other than being living bee cosplayers, hoverflies just pollinate flowers and do what’s in their name – hover around. These bad boys are the architects behind those grey (or brown!) papery nests that somewhat resemble a tuft of cotton candy. 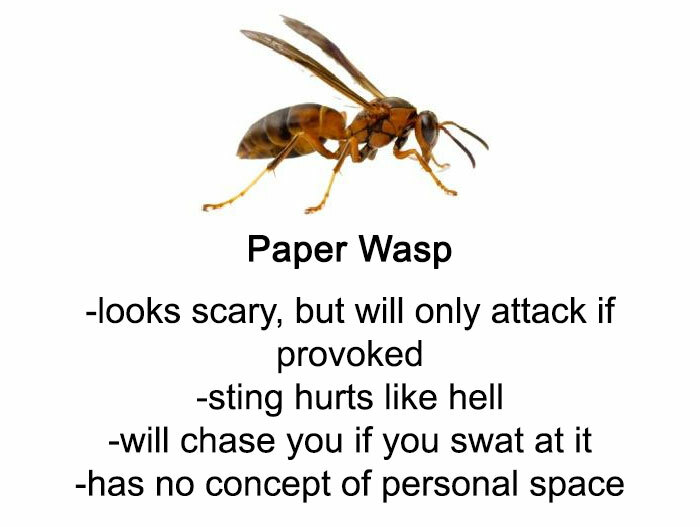 Unlike their sisters, hornets or yellowjackets, paper wasps are genrally non-aggressive and will only sting if provoked, especially when defending their nest. 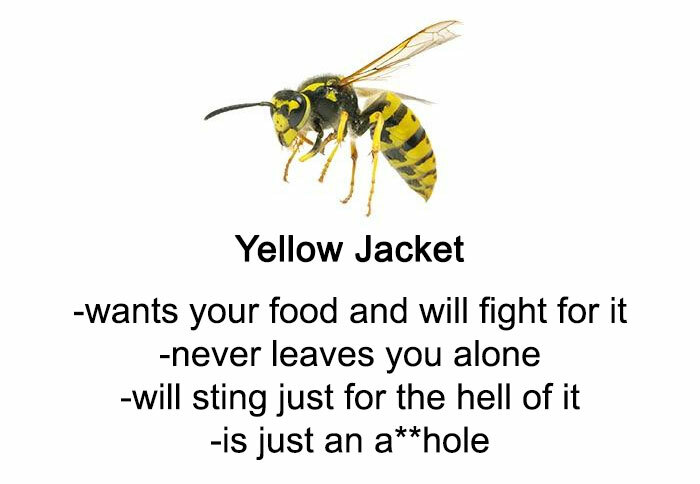 And while wasps generally have a bad reputation due to aggression and painful stings, paper wasps are actually considered beneficial as they pollinate and eat various garden pests, making them especially important in biocontrol. Another one of the textbook insects, yellow jacket is what the common people know as the wasp. It is sometimes mistaken for a bee, due to their similar size and coloring, however that could be one’s big mistake as yellowjackets are aggressive and won’t shy away from stinging. As mean as they seem, yellowjackets also feed on various pest insects making these flying needles beneficial to farming. These are large, scary-looking wasps that live a solitary live. 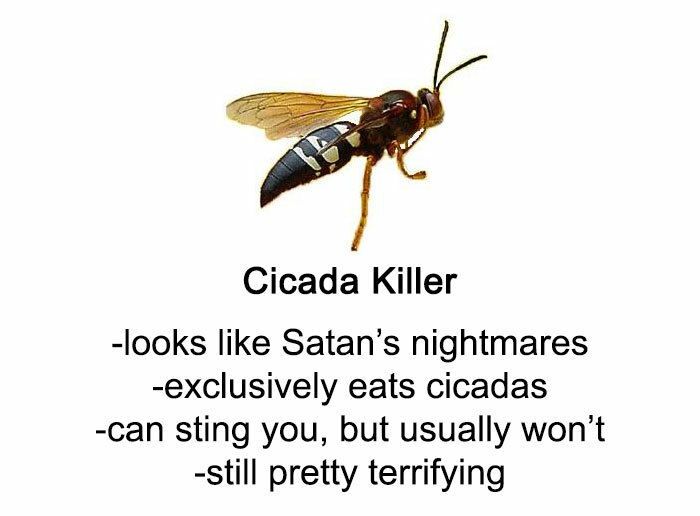 Although they look especially fierce, cicada killers are non-aggressive and only attack when handled roughly. Male wasps don’t have a stinger, just as the carpenter bees. These wasps got their name from their dominant prey, cicadas. As they help control the cicada population and preserve trees on which cicadas feed, cicada killers work as a biocontrol. 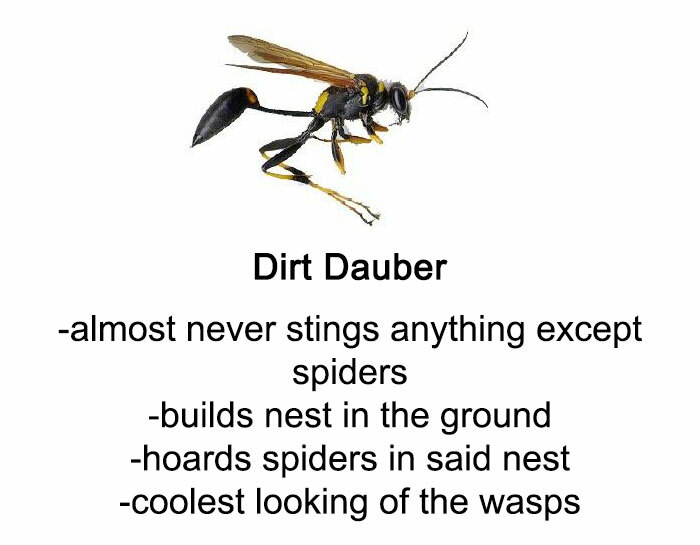 Also known as mud dauber, dirt dauber is a type of wasp that looks very different from most commonly known wasps, as well as any other insect in the list so far. Their name comes from the way they nest, as female wasps mold mud with their mandibles to make a living space for themselves. They prey on various spiders, although some types of dirt daubers are known to keep spiders in their nests to help them guard their home. What to do if you’ve been stung? Remove the sting if it’s still in the skin. Avoid traditional home remedies, such as vinegar and bicarbonate of soda, as they’re unlikely to help. Most people recover quickly after being stung, however, some suffer more severe reactions than just swelling. This could be a sign of an allergy or other illness. In such cases people should seek medical attention, especially if the symptoms are getting worse, it becomes difficult to breathe, swelling occurs in mouth, face or throat area, one feels nauseous or starts vomiting, feels faint or loses consciousness.